This morning he sits up in bed and looks around. He doesn’t do his wake-up stretch. He doesn’t pester Bridget to get up. He doesn’t lie on his back and squiggle to scratch his back. He doesn’t wag his tail. He doesn’t hop off the bed, run to the door, and whimper, “C’mon! It’s a new day! Let’s get going!” He even sits still while I put him in his suit. Hmmm. This is odd. It’s still cold for our first walk of the day, so the crew knows to get the job done quickly. Bridget does her business. Spike looks around. Nothing. He doesn’t even want to walk up the trail behind our camp to sniff all the overnight new smells. Okay. Maybe he didn’t get a good night’s sleep. We go back in and I get the percolator going. I freshen up the water dish and pour out the breakfast kibble. Bridget dives in. Spike lies down, not interested. Bridget carries a nugget of kibble over to Spike and chomps it in front of his face. No reaction. Uh-oh. Not a good sign. I decide to see how he is after a good nap. Bridget snuggles in while I do computer stuff and drink my coffee. I notice Spike is having trouble getting comfortable on the bed. Finally he dozes off. Not eating, not urinating after an entire night. I try not to worry. It’s sunny and warm when he wakes up. We go outside. Spike isn’t walking right. He’s holding up his right hind leg as if he doesn’t want to put pressure on it. I pick him up and hold him in my lap in the camp chair. I check his pads, sliding my fingers in between them to check for hidden burrs or cuts. Nothing. I flex all the joints in his leg and his hip. No flinching with pain. His belly isn’t hard. I massage his muscles. They seem okay, except maybe the inside thigh muscle seems tight. But that could be tensed up because he’s hurting. Or maybe it’s a muscle spasm that started during the night. I hope that’s all it is. I wrap a baby aspirin in a piece of cheese. Spike LOVES Kraft singles! I ask him if he wants some cheese and his ears perk up for the first time all day. Down it goes, carrying 81 mg. with it. I hope this does the trick. “Good boy, Spike!” He limps his way under the BLT and lies down on the cool ground. I run to the computer, get online, and do a search for “ask a vet about dog shivering.” I read that it’s a sign of pain. I hesitate to give him another aspirin. Gee, it might aggravate an internal problem. Now my worry is in overdrive. I hurry up the lane to Rick’s place. “They drive up to Casa Grande or . . . ,” he repeats. I go down the lane and look under the BLT. Spike sees me and starts shaking. My presence must be making him tense up. Oh, if he can make it until the morning, we’ll be at the vet’s door first thing. I go inside to get online and locate some veterinarians. Bridget’s bark is unmistakable. Is that Spike I hear, too? I run outside and Spike is sprinting up the hill, barking his fool head off because a couple with a spaniel is approaching. Great! This is great! The two dogs sniff and Spike lifts his leg on a bush. Hurray! Spike eats a little bit for supper and takes a few sips of water. He sleeps pretty well all night on a cushion and covers on the floor. In the morning I don’t bother putting the crew in their suits. Spike urinates, but he still doesn’t want to put pressure on his hind leg. He walks behind the BLT where I can’t see him. Then I catch him sneaking up the hill to visit Lady, not limping at all. Oh, that’s a good sign! He’s back to his old shenanigans. I chase after him and carry him home. “You can’t visit Lady at 6:45 in the morning, little boy.” He doesn’t seem to be in any pain, although he doesn’t want his kibble. I know! I’ll make him some scrambled eggs! He wolfs down the eggs, eyes bright waiting for me to pass him each bite. Now he’s resting again which is normal for early morning. I’ve got the heater on for his benefit. I’ll watch him until noon and make the decision whether to carry him to Casa Grande. He looks like he might be on the mend. 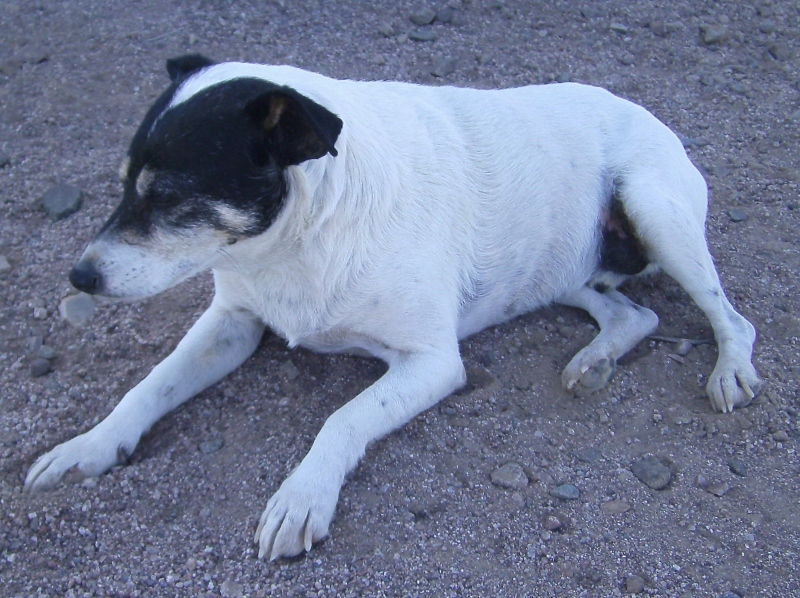 Update: Spike woke up, went outside in the sunshine, looked at me and wagged his tail! I let him walk up to see Lady. No limping! There's his morning stretch! Spikey's coming back! What a beautiful sight. Gosh, how I love him. 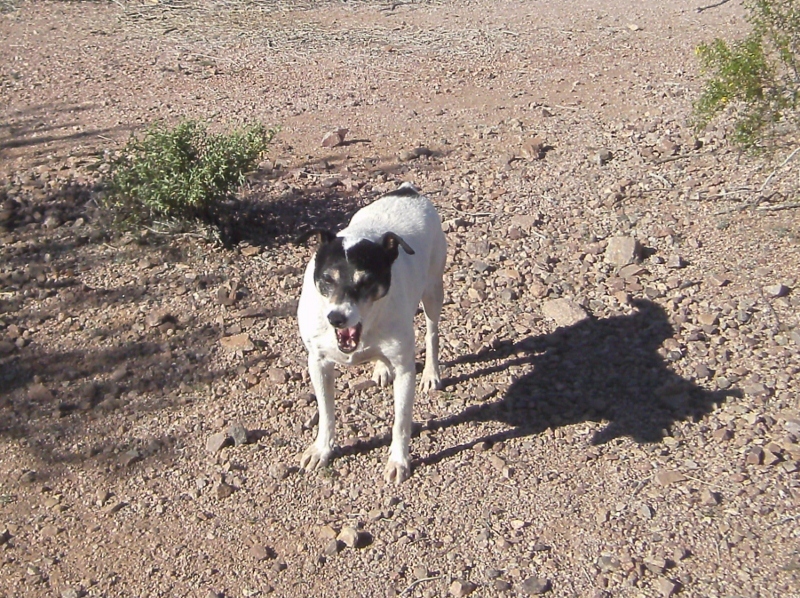 This entry was posted in Simple living and tagged Ajo, Arizona, dogs, vet. Bookmark the permalink. 0 Responses to Something’s wrong with Spike! I had a similar scare with Patches and decided that I would go to Buckeye if she was not better the next day. See my January 12th posting for the story as I wrote it at the time. It sounds similar to Spike’s ailment, except you didn’t mention Patches being off his feed. Spike’s trouble started after a day when we didn’t walk as much as usual. It’s so hard to tell what is going on when dogs are hurting! Oh Susan, my heart was in my throat reading your post. It might be a good idea to write everything down in a notebook so you don’t forget anything and the next time you are in a town with a vet you might have Spike checked out. I know very little about animals…but this I do know, you love that little guy so very much. This blog is my notebook. . . I’m still keeping a close eye on him. He’s taking a sunbath right now. Whew! It really is terrifying when you know there is something wrong but they can’t tell you what it is. Hope he continues to improve. Hi, Sherry . . . So far, so good. I appreciate your concern. Yeah, I’m on the lookout for the fake “ooh my leg hurts” routine. It’d be just like Spike to try to milk this. So thankful Spike is feeling better! Me, too. We’re not out of the woods yet. I’ll stop worrying when he eats his kibble and has a bowel movement. Thanks, Jool! Very thoughtful of you. WoW! Spike has you well trained! Scrambled eggs? Really? hahahaa! Radar used the same tricks on us when we first adopted him! I guess that was his way of getting attention at The Humane Society while he was waiting for us to find him! One day we noticed him limping on the right front paw, next time it was the left front paw…. mmmmmmmm! Took him to the Vet and found out he was fine… he was just a good con artist! I am glad Spike is ok too! Poor guy…. just wanted scrambled eggs! Keep a close eye on him tho, just to make sure! I’m watching him. That Radar! He’s quite a guy. Sue, I love your blog. I am about to retire and hope to be able to travel more in my Casita, but I doubt I have the courage to go it alone as you do. I DO have a life partner who loves to travel too, and I hope we can see some of the country you’ve been writing about. I started reading your blog a few weeks ago; now I’ve gone back and begun to read every entry. How exciting your life is. How strong your commitment to fulfill your dream. I admire you tremendously. Thank you, Donna. That’s a lovely compliment. It doesn’t take as much courage as you might think. Just an attitude of taking each day as it comes, not projecting what bad thing might happen. I’m glad you have a partner who shares your love of travel. Ohhhhh……. This is a Radar trick…..Who says these canines don’t conspire????? Glad he seems to be OK and that he just conned you out of some cheese and scrambled eggs!!!! He’s not getting eggs and cheese every day! He keeps this up and he’ll be on a metal table getting a thermometer up his rear! I agree. Radar is an excellent teacher! oH nO! What bad habits did Raqdar teach Diego??? Sorry Sue !!! Chris, we’re sorry that Radar is spreading his ‘begging’ tricks…..did he teach Diego any bad habits???? Sue, you know Spike is smarter than is good for him….sorry Radar passed on the con artist limp!!!!! Oh so smart our canine friends. Glad that Spike is on the mend. Oh, don’t you just hate that??? I ALWAYS run to the vet too soon, I just can’t stand the worry. We’re without pets now, and decided to keep it that way for a while… so much love, so much worry, so many laughs, and tears, too. So glad Spike has recovered! I know what you mean. I agonize . . . Oh, I should’ve taken him to the vet at the very first sign . . . It’s so hard to know. Going to the vet from where we are now is an ordeal, but we’ll do it if we have to. Hey, why stop there? Let’s see, I must have a recipe for Eggs Benedict around the Casita somewhere . . .
Hi, Page . . .
Thankfully, time is what it took. Spike was scrounging around for some kibble a little while ago. You don’t think that maybe he got a little sore after falling off the bed, do you? Sometimes it takes awhile for the soreness to show up. Just a thought. Glad he’s feeling better. Could be. Or perhaps sleeping in a cramped position on this narrow bed. I’m going to see if I can’t get him to sleep on the cushion on the floor again tonight. If that works, I’ll be more likely to order him a comfy dog bed I could keep under the table. How old is Spike? He acts young most of the time. I wonder how he is with poached eggs with Hollandaise? There is no end to the delights you might prepare. It is good that you now have the information about the vet’s location, should you need it. I don’t know how old he is. You’re right. He does act young a lot, but he also shows age . . . I thought I had him for about six years but I came across a dated photo that shows I’ve had him for at least seven, probably eight, years. And he was an adult when I picked him up at the pound. Whew! I was really worried about Spikey there for a few minutes. Hopefully he is back to his old self. I know it is really hard when they get to a certain age. My miniature poodle is 15 yrs old in people years. Sometimes the arthritus kicks in… He has been moving pretty slowly lately, but it has been cold and damp (how unusual for the Pacifi NW, not!). Anyway, I do hope Spike is completely back to himself and you can stop worrying! Spike just went on a short walk with Bridget and me. He’s back to caring what everything smells like. It must be hard to see your 15-yr-old poodle struggling with arthritis. Our 16 year old 40 lb sheltie is having some arthitus and we have started giving him 1 Osteo Bi Flex a day and he improved in a week. Our niece was giving one to her 60 German Shepard and it worked. Might try a 1/2 for your min poodle…..Spike is quite the character and I (personall) believe that he is a con artist along with his bud, Radar!!! I read the title and it took me a few minutes to open it to read it. I am so glad to hear that he is doing better. It is so scary when an animal is sick. I have three beautiful cats, a small dog, my son has a rat and a fish. Yes we have a house full, and its hard when they get sick, yup even the rat, he is quite the amazing animal. So relieved to hear all is well. Take care Sue, glad to hear Spike is on the mend.. Thanks. Best wishes to you and your pets, even the rat! I were up on the edge of my seat read’n bout little Spike. So glad to hear he is on the mend. Think’n that Spike conned you into a scrambled egg breakfast just don’t fit in my book. They don’t do that. When they hurt or are sick, they will show you by their actions…..or un-actions. Oh, Spike definitely was hurting. It looks like it was a pulled muscle. I really wasn’t sure what I was going to find when I opened your post. I’m sure glad Spike is doing better now. It breaks my heart when they don’t feel good and they can’t tell us what’s wrong. Skittlez has had diarrhea for the last five days and we have no idea why. Other than that she seems fine so I fixed her some rice and chicken and she’s finally starting to come out of it. So scary. Diarrhea is VERY scary. Spike had it once. I raced him to the vet and he was severely dehydrated. Hope your Skittlez is okay. Scary for sure. IF it were me, I’d go to the vet tomorrow anyway. Tell him everything that happen and have him run his test. Reason I say this is kind of hard. Had a cat the went though a similar thing. Turns out she had suffered a stroke . Keep a close eye on him and seriously consider the drive to a vet . I’ve been watching him closely all day and chasing after him! He loves going up the lane to be with Rick and Lady. As soon as I turn my back, off he goes. I ended up putting him in the pen. He’s doing great. . . back to licking Bridget’s ears and eating her food. Here’s some advice from a vet: Get Spike to a vet. Why wait to see if he gets better? He could just as easily get worse. Or rebound for a day and then get worse. He’s an older dog. If he was 3 yrs old, it might be different. He could have several of any underlying problems that we see on a regular basis every day. Try to find a vet who will do some bloodwork and give a complete and thorough exam. If they find nothing wrong, hurray! I believe that our senior pets need at least a wellness exam and bloodwork every 6 months. That’s what I do with my own dogs and cats, and that’s what we recommend to our clients. Just my 2c worth…. Spike is better now. I can’t run him to a vet every time he limps or walks funny. If he hadn’t improved dramatically this morning, I would have taken him to the vet. When pets hurt, we hurt also. But the breakfast eggs and being determined to see the lady friend is a good sign. Our nephew and wife just moved to a new home in Buckeye. Never heard of the place before and today I heard it twice. Once mentioned by you and the other when their new address arrived via an email. Hoping all of you have a restful night. Isn’t it strange how that happens? You hear something twice in one day that you’ve never heard before. The crew’s asleep after an active day. Sometimes it’s like I have two toddlers. When they finally fall asleep, I’m so relieved. I’m for taking him to the vet first thing, tomorrow. Hopefully, he’ll check out fine, and your mind will be relieved. My Jack had a very serious illness that would have killed him if we hadn’t discovered it in a routine blood test–no symptoms. Don’t want to scare you, but it saved his life–and you don’t want to get to the middle of the night only to find that you need to rush somewhere with him. Good luck! Keep us posted about Spike. Thanks, hobopals, for all the info you sent along with this comment. I’m glad your Jack is okay. Spike is doing well now. Good. Glad to hear it. I know how they can scare us. It is very easy to make friends among rvers. It’s almost impossible NOT to! I am not a gregarious person, yet I’ve never felt excluded from any gathering. When I’ve needed advice or a helping hand, there’s always been someone (or several) ready to help. When you think about it, it makes sense that it would be so. People don’t go camping to be miserable or to make trouble. They camp to enjoy life and the world we live in! In these days of cell phones, internet, GPS, excellent roads and maps, 911 services, etc., it really doesn’t take as much courage as people may think. Thanks for commenting and for your good wish for Spike. Good luck with your plan to travel the U.S.! That’s a wonderful plan! I’m happy to hear you are enjoying my blog. Your comment is very interesting. I’m certified to teach math, science and language arts in grades 4-8. My first year I taught 4th and 5th graders, remedial math and lang. arts. Second year I was a 5th grade classroom teacher. Then I moved to a middle school and taught 7th grade math (my favorite! ), then lang. arts, science and math to 6th graders, and finally math to 6th graders. I taught for eleven years. I can’t imagine teaching for 39 years. I can understand your need to escape! Thank you for the compliments. I’m flattered that a high school AP lang. arts teacher would continue reading my blog despite the frequent sentence fragments, unpredictable paragraph breaks, and, uh, creative punctuation. And the many times I start a sentence with a conjunction! Al, I certainly agree with your comment about humans. I can personally attest to having “off” days, (much more often than when I was younger). Sometimes what it takes is just giving in, not eating much, laying around for a day or so, then deciding to get on with life. For my two doggie companions, however, I don’t wait too long before I seek a professional vets help. I know that sometimes their problems will just go away, too. But I would feel really bad if there was some underlying health issue and I left it untreated. Getting blood workups done every six months is a good idea for our aging pets. Sue, so glad that Spike is okay! I know how scarey it can be to try and figure out if your dog is sick. Fortunately, we fret about them a lot more times than they are actually sick. And Phoenix is quite a way to go, especially since it would likely be a round trip! Add to that the time it takes for the visit, given that you didn’t have an appointment… Anyway, it is such a relief that Spike is okay!